I’ve been reared to go down to the well for a bucket of water, bring it back up, fill the black pot. … My baking is done on the hearth fire. I bake my own bread in my pot ovens. Perhaps it is long drawn out. But it’s all I’ve ever known. In 1992, Margaret Gallagher was turning 50. She landed her first job at 46, working as a local historian. 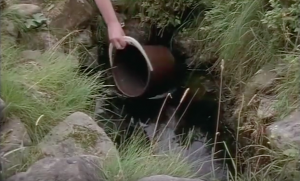 Today she’s still living in the same cottage, with an MBE and a hearth fire and a big pile of books, and I can’t stop watching the opening moments of John Callister’s beautiful film of her daily living. Over and over, I watch her bucket dip into the spring, and how she steadies herself slightly as she turns on the small stone step to carry water back to her home. I don’t know how I found this video, but YouTube is now eager to suggest that I might like to watch other things about Irish cottages, or old people, or the Queen. It’s watching me back, trying to mine the sentiment that brought me here, to take on the chore of thinking for me so that I don’t summon the energy to leave. But I’m not a rational market element with a one track mind. I have all the tabs open, all the tabs. I am avoiding Moodle with near-religious conviction. And look: here’s Barack Obama and he has a beard and is somehow even hotter than before, except that he doesn’t, it’s photoshop, and the network composes itself again around this little bit of insider knowledge, this homage, that takes such delight in foolery. Attention in the network isn’t even a butterfly, it’s a reflected bit of dancing light, it’s nothing and never was. I’m running through my life with a phone instead of a bucket, trotting and scrolling, putting out a hand to steady myself on the steps so that I don’t pitch headlong into a pile of students because I’m trying to find the meeting email and skim the agenda before I walk into the room. I came to this university in 1995. It was a hot summer. The cicadas were startling. I was shown a room and a computer, and my first job was to understand the email. The head of department, who didn’t really understand the email, still had a personal secretary but the email was about to change that, and many other things. I called a friend at another university. “I have email,” I said baffled. “Oh! We’ve got one for the department.” she told me. It felt like we’d discovered a secret spring. What I’m hopeful about is that because cyberspace is an interactive medium in a human sense, we’ll be able to go through this info-desert and be able to have something like tele-experience. We’ll be able to experience one other genuinely, in a truly interactive fashion, at a distance. In a way, Barlow was right. Now the network is experience itself, dopamine-driven, sentimental, frightening, corrosive, comforting. We gather at the well each day to marvel and scold. “Look,” I say to my daughter. “Here is this amazing woman carrying water in a bucket, watch it with me.” I don’t notice that she’s in her work shirt, literally weeping with exhaustion at the thought of another 6 hours at her checkout. She’s 17 and she’s already learned that time is not her own. She has to show up so people who are rushing through their lives can make last minute Valentine’s Day purchases. “Wait, is Valentine’s Day a public holiday?” she asks, brightening. I have to tell her no. John Perry Barlow and bell hooks talk about love and dying. They have shared loss. They can’t know about the future, when things will come to pass for either of them. Neither can we, and if we could, what would we do? What would we do with this year, this day, that knowing? The irreducible fact of mortality continues to shape to how we choose to live. bell hooks: Whereas my mother in Kentucky always used to say, “Life is not promised,” in the sense that boredom is a luxury in this world. Where life is always fleeting, each moment has to be seized. For us children, that was a lesson in imagination, because she was always urging us to think of the imagination as that which allows you to crack through that space of ennui and get back going. For hooks, this work of the imagination is bound up with the need to put out your own garbage, to do for yourself the chores that you don’t want to do, to maintain attention to the little things of daily life. “Chop wood. Carry water,” says Barlow. Think for yourself, at least. It’s 2018. I’ve joined a short global dialogue about participatory engagement in a time of polarisation, via the EdX platform. You can find it on Twitter at #engagemooc. You can find people writing about it including Sherri Spelic and Kay Oddone, and you can come join it. It involves many people I admire, especially Bonnie Stewart who since last year has been developing ways of connecting long-standing community-led education institutions like the Highlander Research and Education Centre and the Antigonish movement to the network that we live in, and the education that we need for the future. The future is in moving out of the self into another space, not as a kind of tourism, but as a willingness to bring something to the other situation. This is involved with the whole tradition of gift-giving around the world. I think true hybridization is about your taking whatever you have to give and mingling it with whatever other folks have to give. The work in network is the water lifting. It’s the labour that the algorithm can’t appropriate, that needs our time and vulnerability to loss. And to restore this vision of the networked self having the capacity to labour cooperatively and effectively, to bring something to the other situation, we first need to imagine other refusals: of the email, of the browsing, of the personal branding, of the suggested-for-you. There’s still a well. We just need to learn how to make time for it in our lives. Kate, this feels like a very solemn gift, one given quietly with warmth and also a hint of sadness. The labour of being present here in these networks, infusing them with purpose in order to do what is helpful, kind, generative, welcoming, resourceful… that labour is real and costs us effort to not be taken in by the structures that pander to our fear of boredom. You describe our very dilemma so beautifully, I can almost forget for a moment that I am, you are, we are engaged in struggle – to be real, to be ourselves, to be safe, to provide care and attention and still avoid becoming that singular market element the algorithms continually try to sniff out. This post also gives me hope. That as you continue to hold up the mirror, we will wake-up again and again and shake ourselves loose from the hypnosis we keep aiming to escape. Thank you so much. Kate Bowles, thank you for this post. Its very inspiring.